Pancakes have always been something ‘special’ offered for breakfast. After all, they are cakes. Just pan cooked instead of in an oven. Cake carries with it a deep felt honoring that comes with celebration, of a birthday, of an end of a meal with dear family and friends, for congratulations, and gratitude. Pancake could be considered a celebration of the start of another glorious day. I mean, you really have to be in this mood to eat pancakes, don’t you think? Curiously, for all my typical morning enthusiasm, you would think I’d be eating them every day. But it wasn’t until the recent imminent arrival of an old friend who loves pancakes, that I determined to make these morning delights for the first time in a very long time. There are endless variations possible. 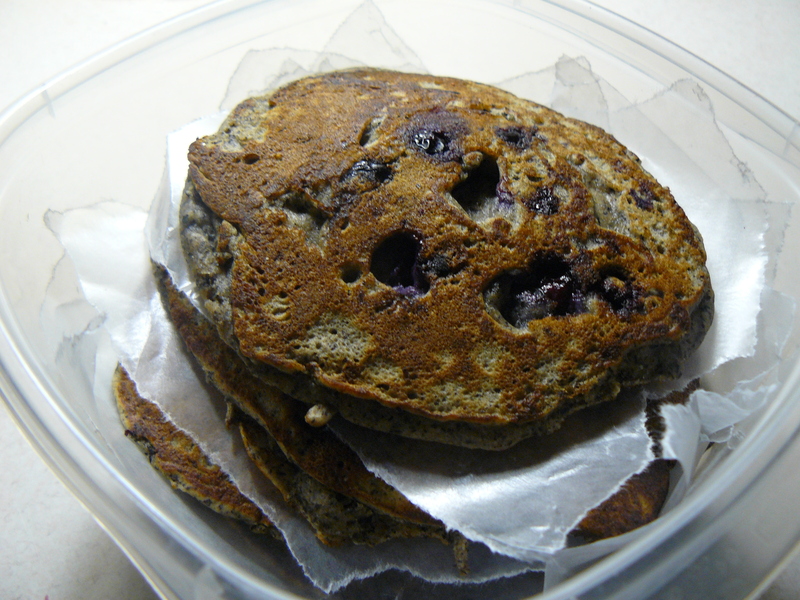 They can be simple bisquick style or more lavishly appointed with exotic ingredients. But pancakes are all essentially the same ordinary thing. Some ground grain with egg, a small amount of fat, and a liquid, cooked on a very hot pan for a short period of time. I pull out my jar of locally grown ground buckwheat, a bag of whole wheat pastry flour, the beautiful farm eggs, my homemade mother’s milk, and butter. Mentally note the heavy creme and maple syrup in the refrigerator. Google quickly locates a recipe for me to easily adapt with these ingredients.*. 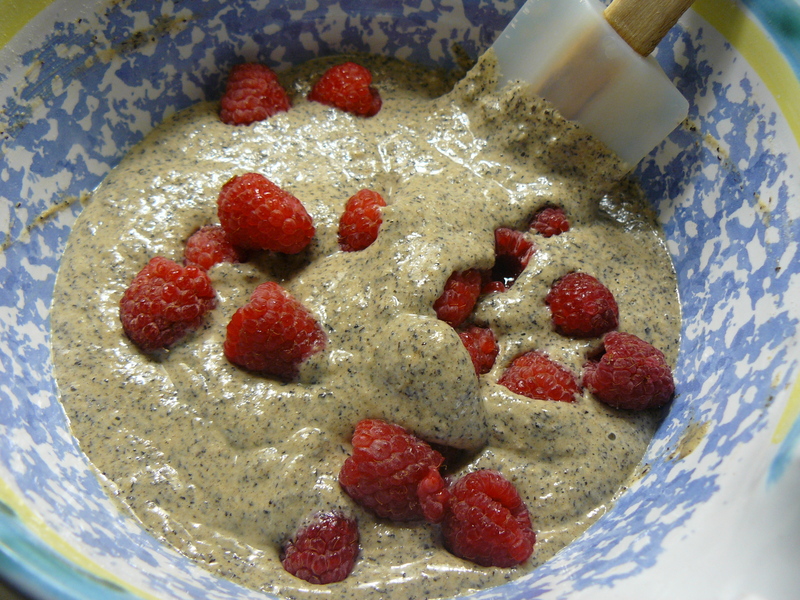 The batter is prepared and waiting for the griddle before my friend arrives bearing fresh raspberries. 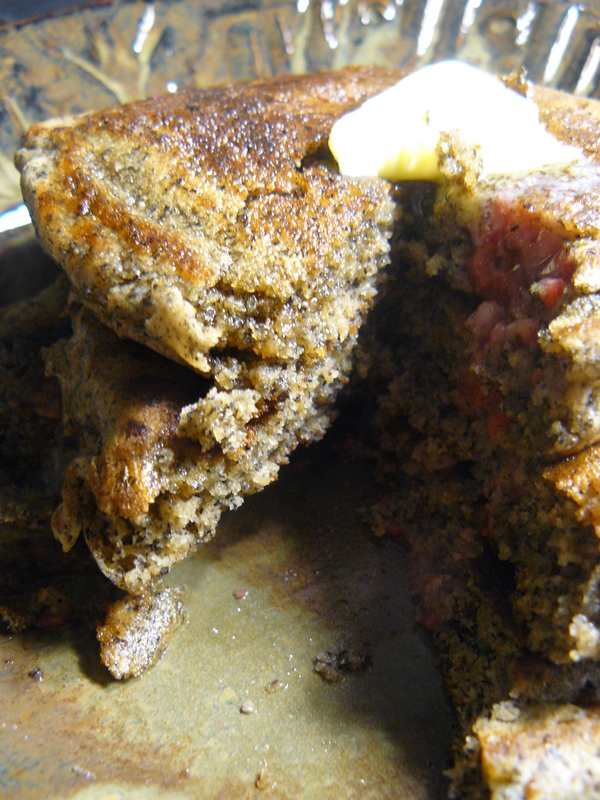 The berries are promptly rinsed and added to the batter. The weekend with these friends was very special. It was their first time visiting my new magical home and we were looking forward to finding ritual to share with each other here. We call each other ‘sister’, our bonds deep and sacred. We’ve been in each other’s lives for about ten years now, sharing the training and life transforming work of energy medicine. Walking the land with these friends and witnessing their reverence and childlike enthusiasm did my heart good. 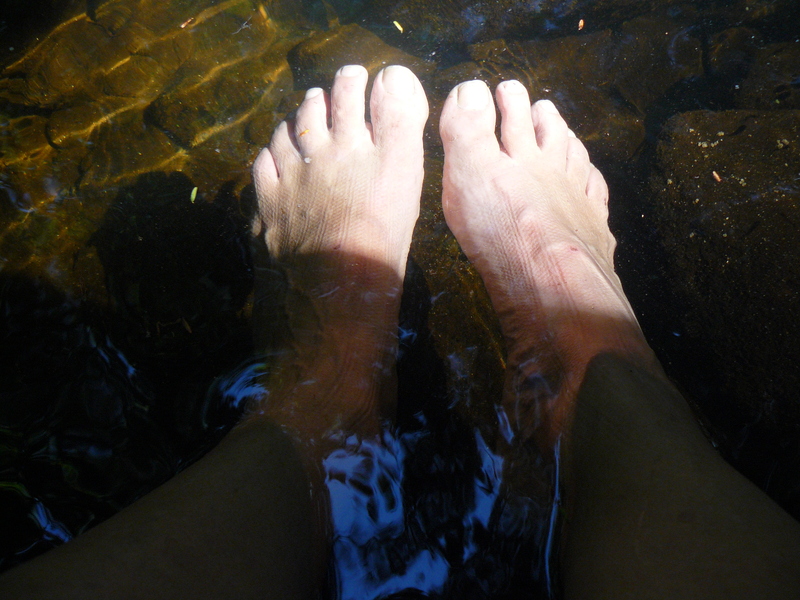 When we found the place at the brook that called for us to commune together, it didn’t take long to shed shoes and socks and get feet into the water. I had already captured this gesture from a walk earlier in the day in a photo of one pair of sister feet. These are feet that have found pleasure in resonance with both the solid and fluid ground beneath her. Naked and exposed and integral to the beauty of the body to which they are attached, they relax and joyously meld with partner Earth. 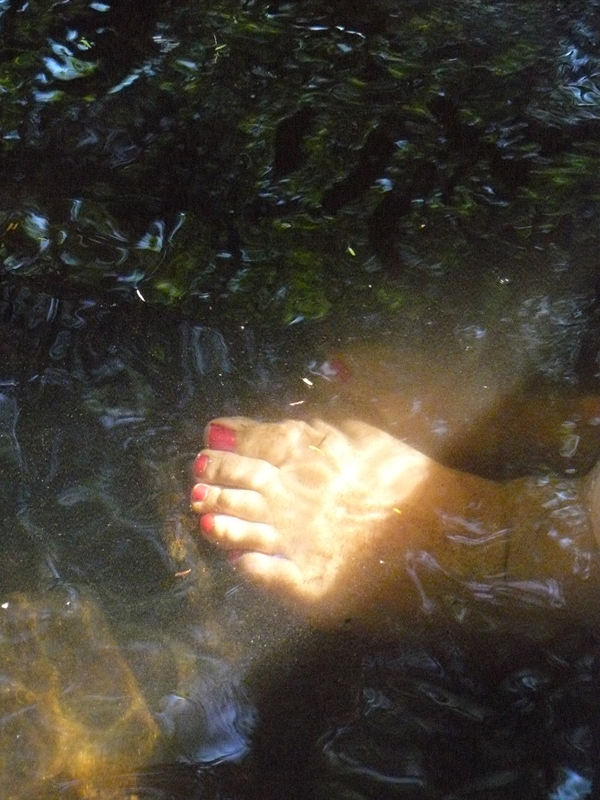 Later, looking at all four of us with feet dangling into the brook in the woods behind my house, I honor the beautiful painted toes of another who has endured painful foot surgery over the years and is more conscious than most of the tenuous relationship to Earth while moving on her feet. Then I look at my own feet. I will always choose barefoot over wearing shoes if I can. I like the feel of steady and balanced I feel on my feet, and for this, realize I more often than not take my feet, and their relationship with Earth, for granted. Too often they are just considered ordinary and just a part of the human skeleton after all, but here, aren’t they grand in their ability to transmit the love and light of mother Earth into the human body? The image of baby discovering his/her own toes and deftly getting them into mouth, comes to mind. Then an image of the innocent child discovering for the first time the pure joy of immersing bare feet in the water. Then the image of a young woman, wanting those pancakes but thinking they are too fattening or should only be eaten on special occasions, and how all too soon, the joy gets contained, maybe even strangled, in so many ways, in shoes, in routine, in shoulds and should nots. Pancake breakfast morning arrives. We eat with gusto in anticipation of the ‘despacho’ ceremony we are about to create together. The intent to engage in this ancient Peruvian ritual gives us a way to offer gratitude for the magical land I now share my life with. 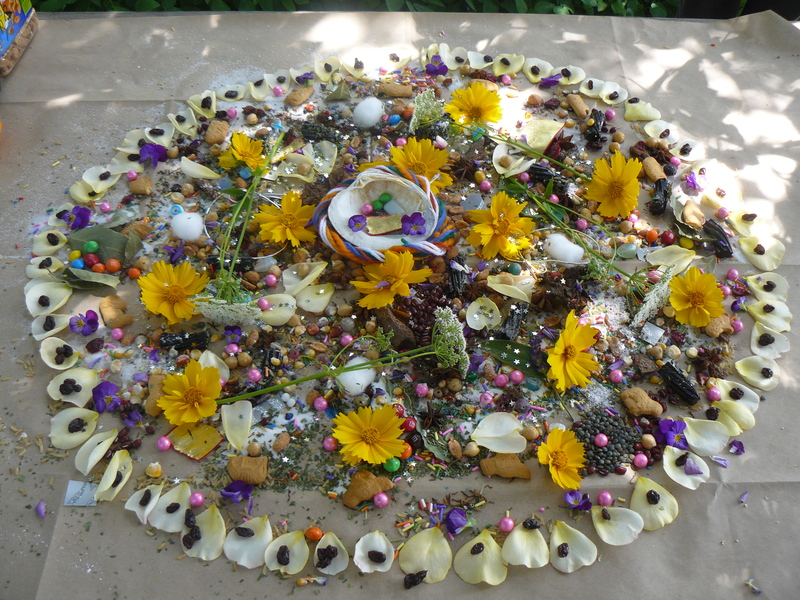 One sister trained in shamanic healing practices leads the way. 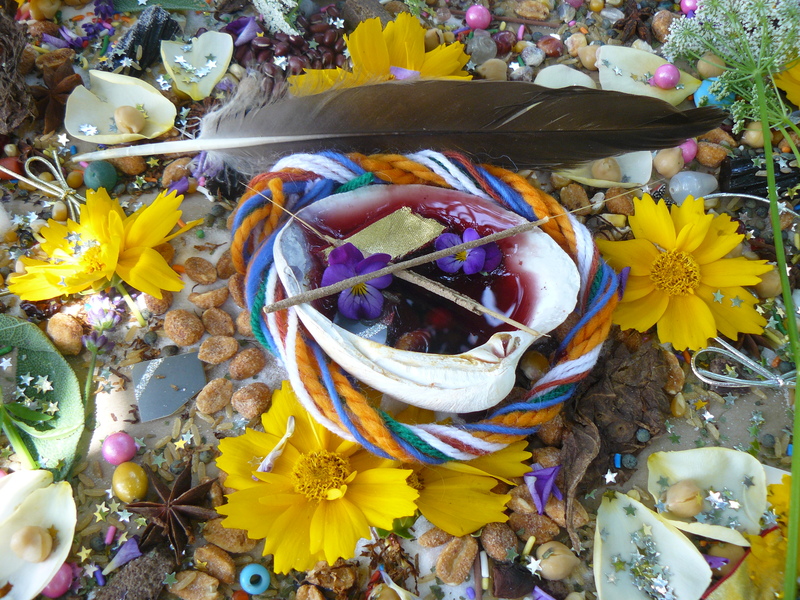 We each came prepared with many offerings, everything from dried beans and corn, candy, sparkles and flowers to wine, colored rainbow yarn, fresh herbs and brightly colored beads. After breakfast we lay out the paper onto which we create and then wrap the despacho. We silently offer prayers while simultaneously placing our material offerings. It doesn’t take long before a most beautiful assemblage forms. In the space following completion we rattle and drum and sing our gratitude into the despacho. Then simply fold and wrap the whole thing up, reverently walk it into the woods, and bury it. In another bowl, whisk wet ingredients with egg. Then whisk in melted butter. Pour wet into dry, stir to just mixed. Heat griddle, add a bit of (sunflower) oil. Measure 1/4 cup each pancake. Ps…do not be shy about making these you just yourself! Just cook up the rest of the batter, cool pancakes on paper towels, and load into container separated by pieces of wax paper and freeze. OR simply cover the batter and refrigerate until the next morning, smile….